Hello dear ! Welcome to Wikirote. Today in this computer world everything is based on data transfer that is possible through portable memory storage devices that are the memory card, pen drives, and Hard drives. However, sometimes due to viruses and improper ejection of these drive leads to the corruption. And in that case, windows can’t format your portable memory drive properly. So to resolve this issue we are here with a trick to Repair Corrupted Memory Card or USB Hard Drive. Sometimes due to viruses and improper ejection of USB drives leads to the corruption. You can now easily repair your corrupted memory card/USB hard drive using the discussed method below. Follow the full article to know about it. By this method, you can easily repair your drive and can use it. 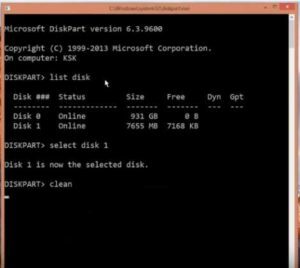 The method is based on an uncomplicated command prompt trick that will force format your external drive and then you can use it smoothly and error-free. However, note that this will delete all your files from USB pen drive and if you have any of important data, then use the recovery tool to restore these data before implementing this method. So just follow the simple steps discussed below. Step One : First of all, you need to connect your Memory Card/USB Hard Drive to your computer and remove all other drives if you have connected. Step Two : After that click on start and then type cmd and then press enter. 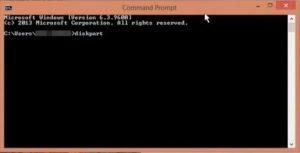 Now type DISKPART in command prompt and pop up might appears asking for permission, click on ok. Step Three : After that you need to type list disk there, and you will see all the disk will get listed there. Now there you will see your external drive, note down its disk number. Step Four : Now type select disk disk_number (for ex-select disk 1) and press enter. Step Five : After that you need to type clean and press enter. Step Six : Now type create partition primary and then press enter. Step Seven : After that type active and press enter. Step Eight : Now enter the command select partition 1. Step Nine : After that you need to type format fs=fat32 and press enter. Now once all of these tasks done it will take some time, and after that, your drive will get format successfully and become ready to use.